We covered a lot in the A10-7870K review which also applies here to the A8-7670K, although the A8 follows the other A8 APUs by having six compute units for the graphics, or 384 SPs. 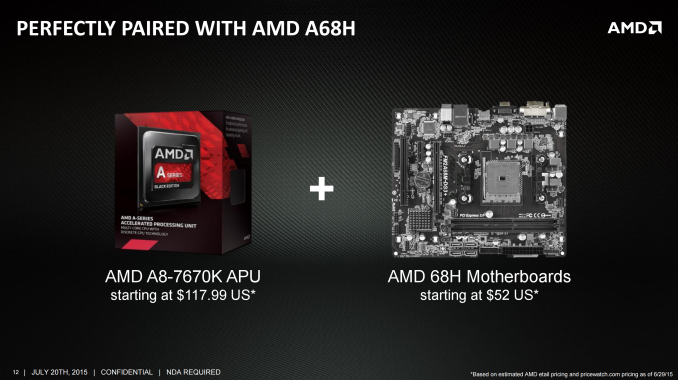 As AMD does not have a new mainstream desktop APU launch for Windows 10, the current stack of Kaveri and Kaveri Refresh APUs are going to be the focus for AMD, especially with back-to-school sales late in the summer. 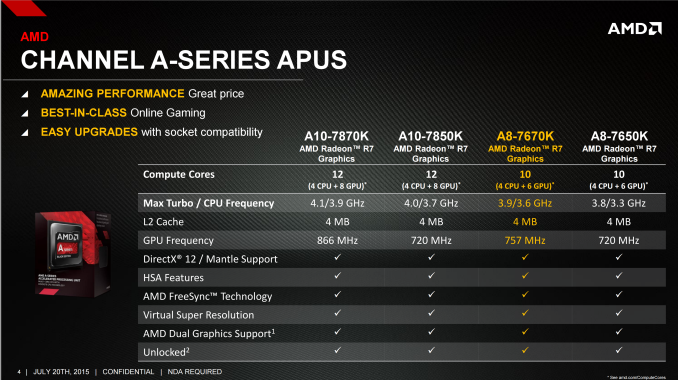 As a result, a good portion of the press release for the A8-7670K revolves around the use of AMD’s GCN architecture and its alignment to AMD’s mainstream graphics cards, allowing any software that is accelerated by one to be accelerated by the other. As shown above, this includes video playback, DirectX 12, accelerated video encoding and streaming as well. AMD’s marketing slides position the A8-7670K at $118 MSRP against the i3-4160 at $120 – and as a result we see benchmarks that require four full INT cores (7-zip), or those that rely on the GPU for part of their compute (PCMark 8), coming ahead. When compared to a discrete GPU solution, AMD suggests that an equivalent cost to the A8 is an Intel Pentium G3258 with a GT 730 discrete card, where the discrete card loses in popular eSports gaming titles. 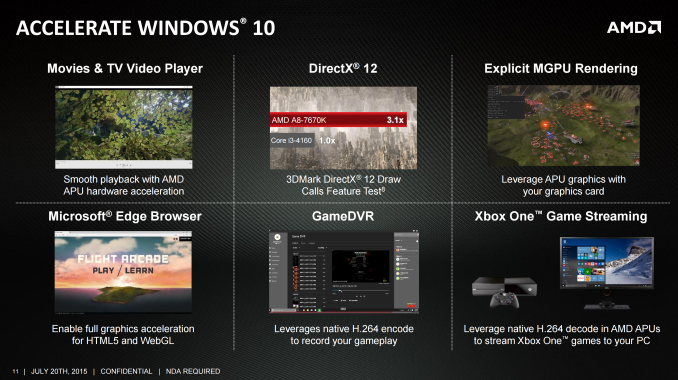 As has been the case for AMD, they play to the strengths of their product, and these lie in that sub-$700 gaming PC (based on the A68H platform) built for eSports that should also help with future DirectX 12 multi-GPU rendered titles. The AMD A8-7670K is officially launched today and currently retails at $110 on Newegg, making it cheaper than the official MSRP. If we get a sample in, we’ll write a review and add the data to our processor comparison database Bench. Embedded HBM is much more expensive than normal Dram. So it can (and should) be used as video-memory, to avoid the bottleneck of the bussing (even the DDR4 cannot come close to the bandwidth of GDDR5 which, in turn, does not come close to the bandwidth of HBM).